Phew, there's no end to this truly wondrous city. First stop today -- Notre Dame. Arrived in time to hear the organ playing during Mass, but it wasn't great music. None of the full, rich sound that massive organ can produce. In the square in front of Notre Dame, you will find Point Zero. This is the point from which all distances in France are measured. We then walked past The Prefecture of Police - even this building has gold-plated gates! 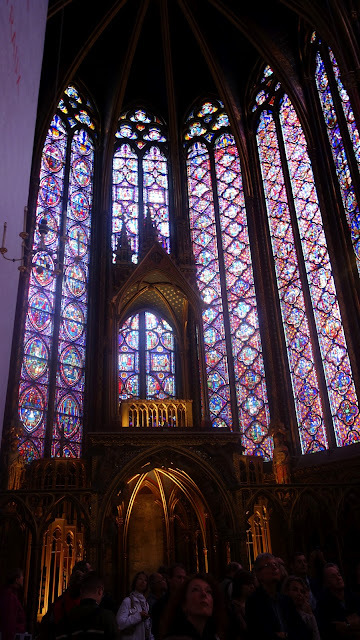 We were on our way to Sainte-Chapelle, which we missed seeing during our last visit. It's referred to as a "jewel of light". No wonder! The upper chapel is surrounded by stained glass windows and your breath is taken away the moment you step inside. 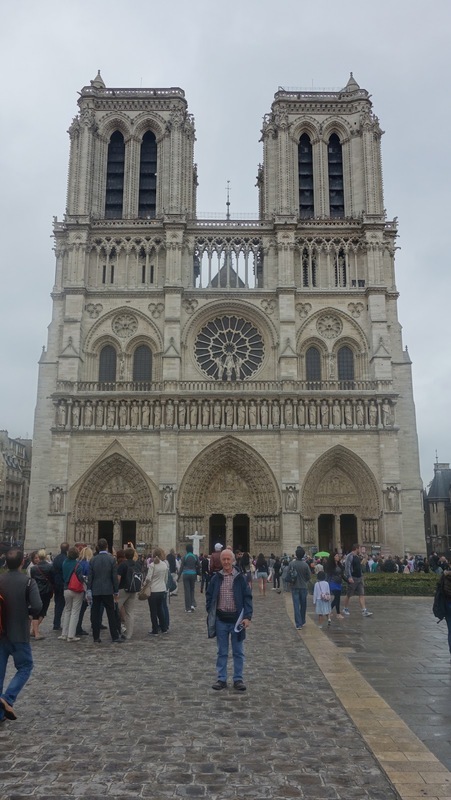 It's a Gothic masterpiece which was started in 1244 or thereabouts -- one of Paris's oldest and most significant monuments. The photos convey nothing of the magic of the chapel. 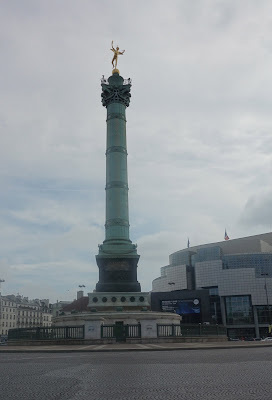 We then went to Place de la Bastille. During the revolution, the prison that stood here was totally destroyed. The Colonne de Juillet (July Column) commemorates the events of the July 1830 revolution. Was that France's third revolution? They love revolutions! Vive la revolution! From Place de la Bastille, it's a very short walk to Place des Vosges -- one of the wealthy areas of Paris. The square is one of the oldest and best-preserved (just like the subject of the photo below). There are 9 townhouses on each side of the square, all still intact. Victor Hugo lived in one of them. We then walked through the Marais District on our way back to the apartment. This district is full of wonderful little cafés, pâtisseries, bookshops, small art galleries, etc. We ended another perfect day with a ride on the Hop-on Hop-off Bus, followed by a cruise on the River Seine. Again, we saw the amazing effect of thousands of flashing lights on the Eiffel Tower at 9 pm (when the river boat left for the cruise) and 10 pm when the boat returned. This still photo will have to do for now. When we can shorten the video, and reduce its size, we'll post it on here as well. It's a spectacular sight.